Hoo boy – that’s some broccoli alright. When the Trader Joe’s R&D wonks get bored with putting pumpkin in things, they must just start drawing ingredients out of a hat and dare each other to make food out of them. How else can you explain Trader Joe’s Organic Pesto Pizza with Tomatoes and Broccoli, the most unusal use of pesto since their Quinoa Pesto. 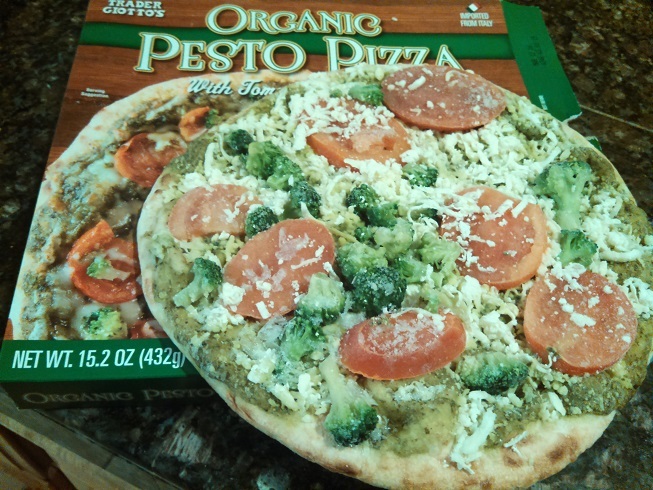 Trader Joe’s pesto pizza looks like any of their other frozen pizza offerings on the surface, but quickly breaks the mold. In place of a tomato base, it instead uses a rich and savory basil pesto. On to this they layer mozzarella cheese, tomato slices and, strangely, little broccoli florets. Not content to stop there, they replace the standard wheat crust with a crisp, sourdough crust. Surprisingly, this all somehow works. The result is a rich-tasting, slightly sour, slightly acidic pizza with plenty of crunch – and surprisingly that works. Each bite is bright and fresh, with a little bit of “zazz” not normally found in the gooey, salty pizza world. Why they added the broccoli I can’t say (this element could have easily been substituted out for a more traditional veggie in my opinion – mushrooms for example) but the pesto base is brilliant, and what ultimately brings the pizza together. I’ve never had a pesto based pizza before, but it fills each bite with that savory, oily, flavorful taste that really works well with the thin, crispy crust and milder toppings. Although billed as a pizza, this just as easily could be viewed as a pesto-topped flatbread with veggie toppings. The pesto is really the star of the show here, making each bite a savory delight and justifying its otherwise bizarre existence. 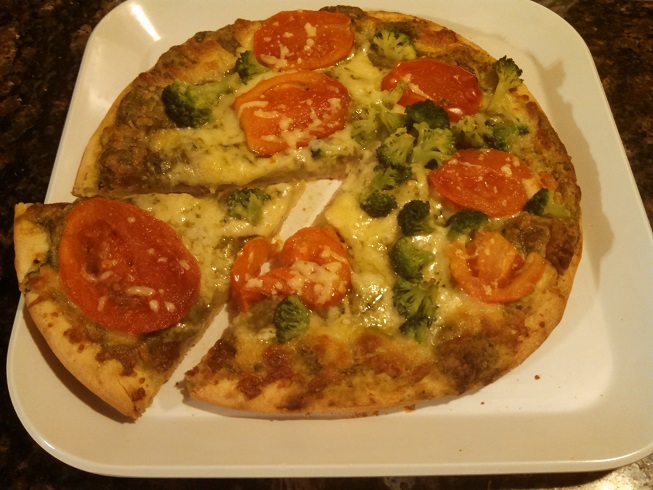 The rest of the ingredients are fine – the mozzerlla is sufficient, the tomatoes are a welcome little change to the texture and mellow out the flavor, and the broccoli is forgettable. As a carnivore, I would have preferred some meat on this. Even despite the all veggie topping selection it still misses out on the “Vegetarian” tag for some reason. That said, it still manages to fit in 11 grams of protein per two slice serving, so that’s not bad. As made clear in the product name, everything in the pizza is laudably organic – from the wheat flour to the olive oil. This is an improvement over the previous incarnation of this pizza, Trader Joe’s Pesto Pizza, which had all the same toppings and was something like 90% organic already. Not an earth-shattering change, but nice. Organic designation aside, the only real reason to pick this up is for the novelty of the pesto. It’s an intriguing take on pizza, and it’d be interesting to see Trader Joe’s introduce some more varieties down the line. Would I Recommend It: Yes, the pesto is good and the broccoli isn’t as scary as you might think. Would I Buy It Again: Sure, though I might get some prosciutto to throw on top too. Final Synopsis: A straight forward pesto flatbread with plenty of zip. you totally tricked me. this pizza has a horrible bitter flavor. the crust on the outside is delicious. anything on the inside is just horrid. and watery. blech. I agree with Jacqueline. This was so incredibly bitter! The crust is perfect and the tomatoes are nice but everything is blanketed in the worst pesto I have ever encountered. Tried to scrape it off but I couldn’t even finish one piece! Horrible! A local pizza parlor makes several pesto based pizza’s. We’ve also made our own at home. Tried this one not long ago. It’s good, and quick, but nothing beats homemade, or a real pizza shop. Not sure why the other two people had a bad experience. We’ve purchased a couple of these and both were good. Interesting. We’ve purchased several of this very pizza and it’s wonderful. A local pizza place makes a couple of different pizza’s with a pesto base, and we’ve made various varieties of our here at home. The TJ pizza is quick, and good, but nothing beats homemade.